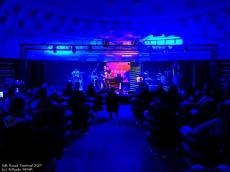 Baku Silk Road music festival continues to amaze its fans with the number of its talented participants and performances. The event, organized by Goethe-Zentrum Baku, gathered one of the most talented musicians from Germany, Turkey, Georgia, Kazakhstan and Azerbaijan. A concert of Georgian TSU ART was held on December 8, Day. Az reported. The debut of the group was in Georgia, on "Student’s days 2011". The band also performed at the "Art Gene 2011" and various charity concerts. In 2012 the band took part in a project called "Georgia’s got talent". During 2012, the band took part in various TV shows and concerts in different regions of Georgia. The audience quickly caught the rhythm and started to dance. Band's performance obviously reached the spectators' hearts and it received a storm of applause. The festival was opened by a wonderful concert of the German music band LebiDerya on December 6. Notably, Goethe-Zentrum Baku is a branch of the Goethe Institute, a cultural institution of the Federal Republic of Germany, whose branches operate in many countries of the world. The organization aims at popularizing the German language abroad and expanding international cooperation in the field of culture. Honored artist of Azerbaijan, musician and composer Rain Sultanov is the organizer and curator of the festival`s musical part. The curator of the artistic part is the initiator of cultural projects Asli Samadova. A series of fascinating concerts will run until December 14.